Hutton Mitchell is now remembered solely for being the first illustrator to portray Billy Bunter, in the boys’ story paper The Magnet in 1908. However, this belies an active and eventful career as an artist, cartoonist, illustrator and author. He was born on 12 February 1872 in Kennoway, Fife, Scotland, and named as William Hutton Mitchell. His parents were Peter McDowell Mitchell, a Presbyterian Minister born in Clackmannan (formerly the county town of Clackmannanshire) in 1833, and his second wife Janet, née McDonald, whom he had married in Perth in November 1869. William was the second of their four children, his siblings being Annie (born in Kennoway on 21 August 1870), Alexander (born in Tillicoultry, Clackmannshire, on 10 November 1873), and Isabella (born on (9 September 1874 in Tillicoultry). At the time of the 1881 census, William was living with his grandmother at Fish Cross, Clackmannan. It appears that his father had died (possibly before the birth of Isabella), although there is no record of his death. At some point, the Mitchell family moved to Dundee, where William was educated at Dundee High School. 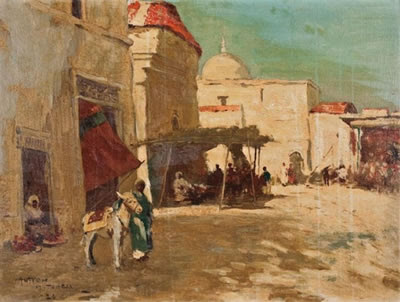 He then went on to study art with the Dundee Graphic Arts Association, before attending Heatherley’s Art School in London and then Julien’s Atelier, Paris. He also visited Holland, and may well have briefly studied there. As far as can be ascertained, he married Alice Mary Odell (born in Clophill, Bedfordshire, in 1876) in 1894, although there is no online marriage record. They went on to have four children: Alan (born in 1897), Alexander (1899), Ronald (1905), and Bruce (1908). The first three children were born in Islington, north London, while Bruce was born in Streatham, south London. (Alan and Bruce later became artists in Canada). Exactly when, and how, William’s career as an illustrator began is not clear. In November 1894, he travelled to New York, and whilst in America he contributed satirical cartoons to Truth, a weekly society magazine. 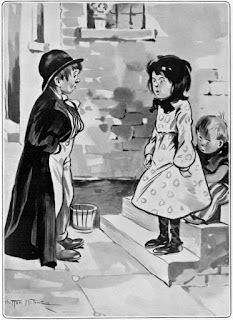 It is not known how long he remained there, but in September 1897 The Dundee Evening Telegraph noted that he was already well-known as a black and white artist to readers of weekly newspapers and magazines in London, along with several other illustrators who had originated in Dundee. Certainly, it is known that by 1899 he had contributed to News of the Week, Fun, The Daily Graphic, The Longbow and The Ludgate Monthly. At the turn of the century, and living at 6 Monte Cristo Mansions, Islington, and calling himself Hutton Mitchell, he began contributing to The Illustrated London News, Black and White, The Spear and The British Workman. He also provided illustrations for the boys’ story paper Boys of Our Empire, published by Andrew Melrose, between 1900 and 1903. He returned to New York in June 1903, where he worked briefly for The New York Herald and The Sunday Herald, before returning to England in October. Surprisingly, especially given that many of his contemporaries were prolific book illustrators, Mitchell appears to have been credited with illustrating only three books, beginning with an edition of Charles Dickens’s A Child’s History of England, published in 1898 by Chapman & Hall, and which also contained illustrations by E.A. Norbury and F.H. Townsend. 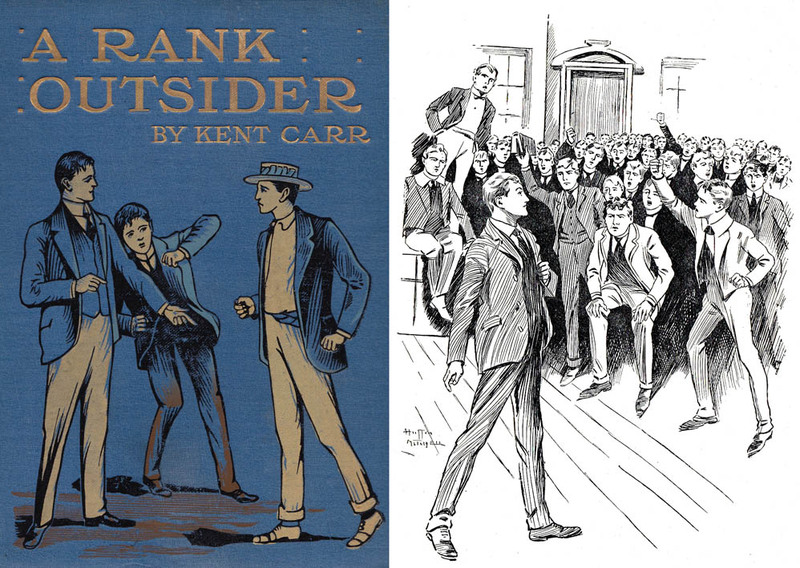 This was followed in 1904 by Kent Carr’s boy’s school story A Rank Outsider, published by Andrew Melrose, and two years later he illustrated Children of the Sun by Mrs J. Percy Creed, also published by Andrew Melrose. He also provided illustrations for Andrew Melrose’s The Girls’ Empire Annual in 1902. In 1905 he began working for The Tatler, providing a series of cartoons under the heading “The Humour of the Hour – as seen by Hutton Mitchell.” A year later, he began providing illustrations for The London Magazine. In 1911 (when he was recorded in the census living at 20 Atbara Road, Teddington, Middlesex – he had earlier been living at 236 Barcombe Avenue, Streatham Hill, Wandsworth) he began an eight-year association with The Sketch, providing full-page and smaller cartoons, and a year later he was also taken on by The Bystander to do the same. In 1914 he began working with The Illustrated Sporting and Dramatic News. During the First World War he also worked for London Opinion and for two weekly humorous magazines aimed at the services – Blighty, for troops in the army, and Sea-Pie, for the navy. At the same time, he was also earning some money as an author, having short stories published in Harry Shurey’s The Weekly Tale-Teller, Cassell’s Magazine of Fiction (1914-1918), and My Magazine. He also illustrated one of his own short stories in the Amalgamated Press’s Cheer Boys Cheer in August 1913. 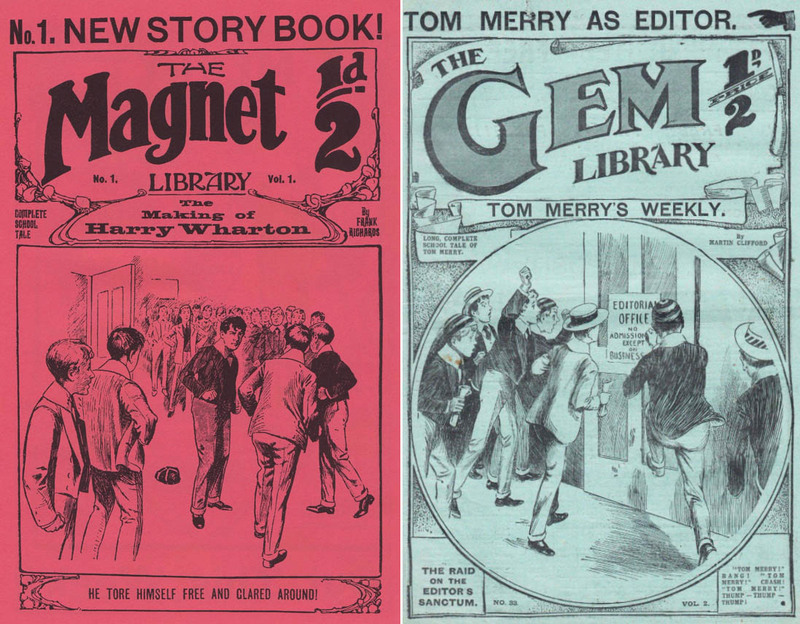 In the meantime, in July 1907 he had been recruited by the Amalgamated Press to illustrate its boys’ story paper The Gem, home to Tom & Merry & Co. of St. Jim’s, created by Charles Hamilton under his pseudonym of Martin Clifford, and which had been launched in February that year. 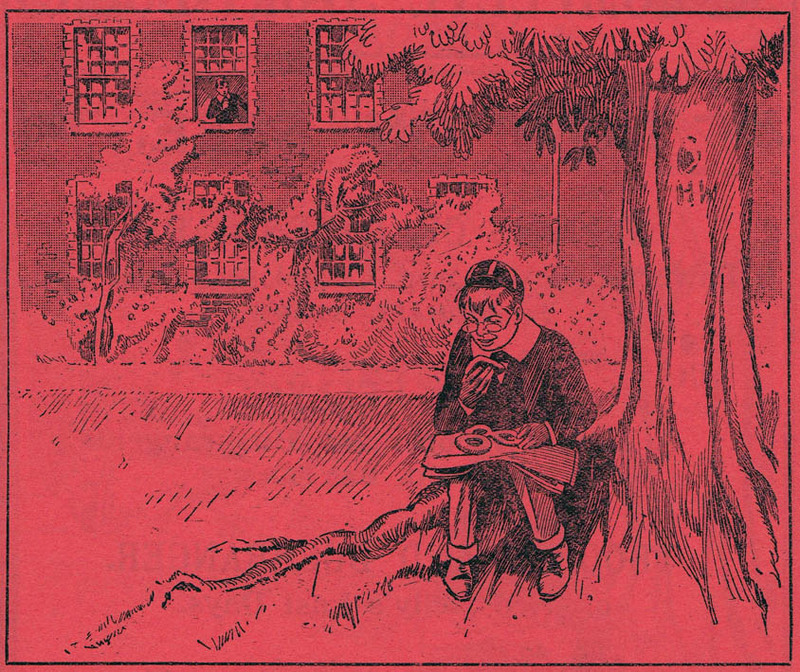 The following year he was also invited to illustrate another new story paper, The Magnet, which was to feature Harry Wharton & Co. of Greyfriars School, and, of course, Billy Bunter. This was launched on 15 February 1908, and Mitchell illustrated the first 39 issues, with the very first picture of Billy Bunter appearing on the cover of the seventh number. This could be seen as simply a prototype, especially in that while Bunter was portrayed as overweight he could not be described as having the rotund figure so familiar today. In the event, Mitchell only illustrated The Magnet for around 10 months. W.O. Lofts and D.J. Adley, in The World of Frank Richards published in 1975, wrote “Mitchell could have had the job indefinitely, but he was always late with his drawings, and at length the editor just could not stand the delays any longer. Mitchell was a very swift worker and could dash off a set of pen-and-ink drawings in a remarkably short time, but he would not start work until the very last moment – and sometimes after. He just would not get down to the steady grind demanded by the Amalgamated Press.” He was succeeded by Arthur Clarke, who in turn was succeeded by C.H. Chapman in 1911. It was he who gave Bunter his trademark check trousers and bow-tie. In March 1914 Mitchell found himself in the dock at the Old Bailey, charged with receiving a stolen rug, which had been thrown from a car as it passed through Barnes and had been picked up by his 17 year-old son Alan, then working as a publisher’s reader, who had given it to his father. The case hinged on the so-called law of “finders-keepers” – the judge ruled that if someone found an article they had a duty to preserve it and see if there was any claim on it, but there was no duty to hand it in to the police. While this would be a prudent course of action, the judge remarked that the police had no greater right to the article than the person who found it. He therefore ordered the jury to find the Mitchell and his son not guilty. Hutton’s career as an illustrator appears to have been rather sporadic after the First World War. In the early 1920s he provided illustrations for The Yellow Magazine, The Red Magazine and The Windsor Magazine, but it appears he was hoping to make his a new name as an author. In late 1922, having moved to East Wittering, Sussex, he finished writing a novel, and showed the manuscript to Arthur Conan Doyle (a neighbour), who, having read it, gave it a ringing endorsement. The novel, The Deviations of Diana, a study of an artist’s model with a magnetic personality, was subsequently published, to a degree of critical acclaim, in April 1923. Unfortunately, it was not a commercial success, and two years later Mitchell was declared bankrupt. In May 1926, giving his address as “Lovelands”, Kingswood, Surrey, he applied for his discharge. The Surrey Mirror (7 May 1924) reported that his liabilities were estimated at £55, while his assets had realised just £8. It was observed that Mitchell “attributed his failures to the non-success of a novel which was published, but had not yielded any profits.” He also blamed ill-health, and his income since 1920 had been insufficient to support himself and his family. He told the local bankruptcy court at Croydon that his present earnings were around £200 a year – around £11,000 in today’s terms. By early 1927 he had moved to The Hut, Wanmoor Road, Great Bardfield, Essex. In May that year he sailed from Southampton to Quebec, to stay with his son in Montreal. A few months later, on 22 October 1927, he married Frances Mary Holland at the United Church, Mountain Street, Montreal, his first wife having died in 1913. Frances, born in Great Bardfield in August 1899, was the daughter of Sydney Benjamin Collins Holland, a publican and house decorator. The marriage took place on the same day that she arrived in Montreal after travelling from Southampton. Whilst in Canada Mitchell embarked on a new career as a painter, in oils and watercolours. He exhibited at the Royal Canadian Academy of Arts and at other galleries. Many of his paintings from this time have come up for auction, which has led many of the websites which monitor the sales of works of art to describe him as a Canadian artist. (They also get his date of death wrong, citing 1939 and not 1935). He also lectured on art and literature at the Canadian Authors Association and at the Arts and Letters Club in Montreal. (According to The Collectors’ Dictionary of Canadian Artists at Auction, Mitchell was, in London, also a member of The Pen and Pencil Club, the National Sporting Club, and The Fabian Society, and was a close friend of Prime Minster Ramsay Macdonald). Hutton and Frances had a daughter, Annette Joy, born in Essex on 27 August 1932. Rather strangely, however, it appears that Frances returned to England from Canada in May 1930, whereas Hutton remained there until December 1932. Annette emigrated to America, where she married in 1955. In the meantime, Mitchell published his second, and last, novel in 1930, The Fourth Man, which appears to have received very little publicity and vanished without trace. He died suddenly five years later, on 5 April 1935, at Saffron Walden Hospital, Essex, where he had gone for an X-ray. His wife died on 6 February 1998.